Warren Bennis once stated, “leadership is the capacity to translate vision into reality.” Great leaders possess impressive social intelligence, a zeal for change, and for the most part, a vision that allows them to set their sights on the issues that truly merit attention. The responsibility of leaders is to develop a vision, provide direction and foster inspiration. Yet, while leaders set direction, they must use management skills to guide their people correctly. The mapped route must arrive at the proper destination. Creates an inspiring vision of the future. Leadership is proactive – problem solving, looking ahead, and not being satisfied with things as they are. Motivates and inspires people to engage with that vision. Effective leaders link together two different expectations – first, that hard work leads to good results, and next that good results lead to attractive rewards or incentives. This motivates people to work hard to achieve success, because they expect to enjoy the resulting rewards. Manages delivery of the vision. Work allocation, delegation and monitoring will ensure effectiveness. This also includes change management. Changes must be implemented smoothly and thoroughly. Coaches and builds a team, so that it is more effective at achieving the vision. Individual and team development are important activities. First, great leaders understand their team dynamics. Successful teams are created because the leader ensures that team members have the necessary skills and abilities to do their job and achieve the vision. They identify, leadership potential in others and nurture this. This creates and environment that ensures success over the long term. Leader and Leadership should be understood properly. These roles are often confused with people who are just managers. Managers may be highly skilled, good at their jobs, and valuable to their organizations – but that does not make them leaders. It certainly isn’t gained by election or by appointment. Having position, title, rank, or degrees doesn’t qualify anyone to lead other people. And the ability doesn’t come automatically from age or experience, either. No, it would be accurate to say that no one can be given the right to lead. The right to lead can only be earned. And that takes time. Become a good follower first. Leadership is influence, nothing more, nothing less. 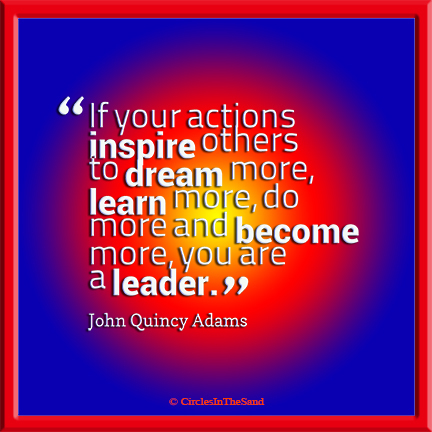 Leaders who earn the right to lead give their all to what they do. Rely on discipline, not emotion. Leadership is often easy during the good times. It’s when everything seems to be against you – when you’re out of energy, and you don’t want to lead – that you earn your place as a leader. During every season of life, leaders face crucial moments when they must choose between gearing up or giving up. To make it through those times, rely on the rock of discipline, not the shifting sand of emotion. Make adding value your goal. One of the ironies of leadership is that you become a better leader by sharing whatever power you have, not by saving it all for yourself. You’re meant to be a river, not a reservoir. People will recognize these admirable qualities and will follow you. Remember that it takes time to become worthy of followers.